What are the dates for ADI’s 2019 Judging of Craft Spirits? I’m not a member of ADI but why is your system is asking me to renew my membership? Distilleries that are not full members of ADI are saved in our database under our “DSP Map Only” member type. This is a free member type that offers no benefits other than being listed in our directory and having your distillery added to our online map. If you want to enter the ADI Judging as a non-member you can renew your status as a “DSP Map Only” for free and then complete the judging registration. How do I find my username & password? Can I have an employee enter our spirits? For Existing users, an employee can enter your spirits into the competition after first signing in with the primary account and then adding the employee as a secondary contact for the competition. The registration form isn’t working correctly. What do I do? Some users have experienced difficulties with some of the drop down menus. Most often this problem can be resolved by clearing the cash in your current browser, opening a “guest” window in your browser, or opening a browser you do not normally use. I click next on the registration and I get an message that I cannot continue. What do I do? If you get a message that you cannot continue to the next portion of the registration, make sure that you have filled out every required field. Any question or field with a red * must be answered before continuing on. How should I package my spirits? ADI & Preiss Imports highly recommends shipping bottles in foam, pulp, or corrugated bottle shippers, or using inflatable bottle bags. See Uline, Polar Tech, Spirited Shipper, and Inflatable Packaging for examples. Your Distilled Spirits Plant number is DSP followed by State abbreviation and a number i.e. DSP-ST-12345. Do not enter your permit number which is looks like ST-S-12345. For bitters and vermouth producers who do not have a DSP or for International distillers, you will enter 0000. These three digit numbers correspond to the class and type of spirit. 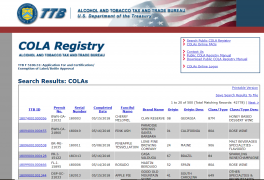 It can be found through the TTBs Public COLA Registry or in CT Box of your printed COLA. If you do not have a COLA you will enter 0000. What is my TTB ID#? This is a unique 14-digit number for each approved COLA. It can be found through the TTBs Public COLA Registryor in Box 1 of your printed COLA. If you do not have a COLA you will enter 0000.